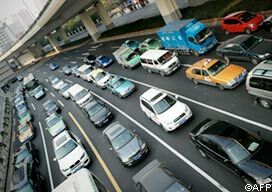 Passenger vehicle sales in China have continued to resist the mainland economic slowdown, rising 11 per cent year on year in July – traditionally a weak month for the motor industry. Deliveries of passenger vehicles for the first seven months of the year rose 7.5 per cent to 8.74m units, the China Association of Automobile Manufacturers said on Thursday. China’s car market – which grew 45 per cent in 2009 and 32 per cent in 2010 – has slowed dramatically since the end of tax incentives introduced as part of the government’s 2008 stimulus package. In contrast, Indian vehicle sales showed signs of a marked slowdown in the face of weakening economic conditions. Figures on Thursday from the Society of Indian Auto Manufacturers showed sales of passenger cars in Asia’s second-largest emerging market rose 7 per cent in July from the month before, below analysts’ predictions. “The economy in general is suffering, while potential purchasers of personal vehicles have been hit by high interest rates and high petrol prices have also hit sentiment in the market,” Vishnu Mathur, director-general of SIAM, told the Financial Times. High dealer inventories are prompting some consumers in China to hold off on purchases, hoping for more discounts, said Shaun Rein of China Market Research in Shanghai, whose firm recently interviewed car buyers. “There is a danger of disproportionate price decrease that could lead to a wider risk of a price war,” noted Klaus Paur of Ipsos consultancy in Shanghai. Meanwhile, GM sales were up 15 per cent on year, helped by a 26 per cent rise in sales of Wuling mini commercial vehicles that are sold mainly in lower-tier markets.